The 2012 corn crop has raised important questions about the validity of forward contracting. Forward contracts are a vital risk management tool because they remove price uncertainty. However, they must be used correctly to avoid increasing risk in other areas, namely yield risk. The purpose of this article is to discuss important pieces of information that need to be understood before signing a forward contract. In the traditional view, crop marketing advisors tell you it is prudent to manage price risk through marketing. Crop insurance salespeople tell you it is prudent to manage yield risk through purchasing crop insurance (revenue insurance potentially provides price protection if losses exceed the deductible). These two decisions are often made independently because crop marketing advisors don’t always understand crop insurance and crop insurance salespeople don’t always understand the market aspects, but this is slowly changing. The decision of how much to forward contract and what crop insurance contract to purchase is related through an underlying price-yield relationship. Let’s assume you took a marketing advisor’s advice and forward contracted a percentage of expected production. Was price risk reduced? Yes, but now those bushels must be produced, so yield risk went up. A combination of price and yield risk, or revenue risk, provides the true measure of how much risk was reduced or possibly increased. Risk stemming from revenue uncertainty rose dramatically in recent years. Production costs also increased dramatically, increasing the risk of losing more capital. Prices throughout the crop year varied tremendously, increasing the risk of ending up in the bottom third of prices. Farm yield risk was likely underestimated because, up until this year (especially for corn), yield has been friendly. Across a large region like western Kentucky, the relationship between harvest futures prices and farm yields is negative, meaning that lower yields generally result in higher prices. The strength of this relationship changes as we move away from average values to extremes. This year happens to be one where that relationship is strongly negative. A number of Kentucky producers are experiencing very low yields with very high prices. However, in many cases this year, harvested yields have fallen below forward contracted levels, resulting in producers buying out those positions. This situation shows the importance of understanding yield risk and the implications of having to buy back overhedged yield. The ability to buy back depends upon the amount of available working capital. If capital is not available, the producer may be faced with default which could result in farm liquidation. Crop insurance could possibly pay back a large portion, if not all, of these expenditures but insurance payments typically come after the buy-out has occurred. So, cash flow is needed. The benefit from crop insurance for the 2012 crop will depend upon the type of selected crop insurance policy. With 2012 yields and harvest prices not yet know a detailed analysis is not yet available. In lieu of this analysis, a good starting point for the 2013 crop would be a revenue protection policy at a high coverage level with enterprise units along with selecting trend adjustment. As for forward contracting, caution is warranted; we are a long ways away from 2013 harvest with likely good pricing opportunities to come, so sell in small percentages until a better idea of crop size is evident. For questions and comments please contact Cory Walters, Assistant Professor, University of Kentucky at cgwalters@uky.edu. Fall Armyworm in the Near Term. I am still receiving calls about fall armyworm (FAW) primarily as they affect pastures and especially reestablishment of grass fields and waterways. Most people are able to get control relatively easily, once the infestation is found; and by now quite a few folks are looking! We have a few pieces of good news. 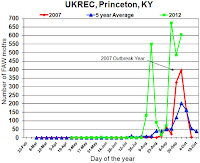 The capture of moths in the UK-IPM trap at Princeton, KY has decreased significantly to 69 moths / trap-week. Additionally, we have a forecast of very cool temperatures and perhaps some significant frost. Both of these will have a generally debilitating effect on the FAW population. 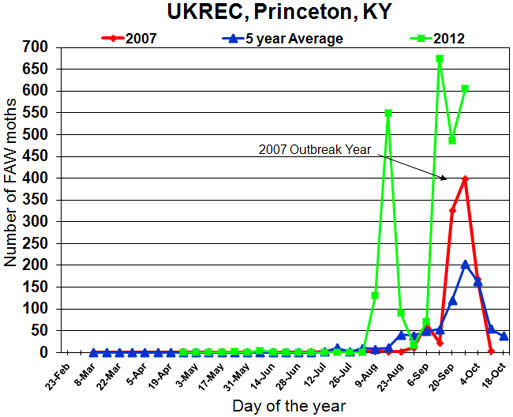 It is quite reasonable to assume that FAW populations will decrease over the next week or so. Nevertheless, it is impossible to predict what will occur in a specific field or portion of a field. That is all completely dependent on how cold it gets and for how long that cold lasts. This is especially important for producers pushing up against the planting date window for newly seeded grasses. If you must plant / renovate in the near term then be sure that: 1.) There is no uncontrolled FAW infestation in your field. 2.) Make sure you begin checking your newly seeded grasses as soon as they begin to emerge for the presence of a new infestation. For those producers planting winter wheat, waiting until after the Hessian fly free date, which from the date of this writing (Fri. 10/5/12) would be another week to 10 days, depending upon where you are located, could reduce your risk substantially. Again, this is almost completely dependent upon the weather, especially temperature, during this time frame. Temperature forecast over the next ten days is about normal. There is a chance of frost on Sat. 10/6 and Sun. 10/7 but after that the temperatures will moderate once again. This weather is certainly not preferential for FAW growth and development and I would expect a continual decrease in the population size. However, I don’t see any immediate event in the next ten days that will remedy the problem for the season. So, for the time being, those with susceptible crops (all small grasses) should keep checking for the presence of this pest. 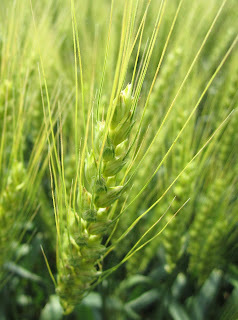 The 2012 Kentucky Extension Wheat Contest winners are published. State champions are awarded to the highest yields each in No-Tillage and Conventional Tillage. Clark Farms of Graves County was the Tillage State Champion with a yield of 115.41 bushels per acre. The No-Tillage State Champion was Blake Edwards of Green County with a yield of 108.51 bushels per acre. For the contest, Kentucky is divided into four areas. Area Champions are awarded to the highest yield in each area (that is not a state champion), regardless of tillage class. Area 1 Champion was Malcolm Oatts of Christian County (108.18 bu/acre, tillage). Area 2 Champion was Flat Lick Farms – Scott Kuegel of Daviess County (109.61 bu/acre, tillage). Area 3 Champion was Jamie Summers (106.73 bu/acre, tillage). Area 4 Champion was Homestead Family Farms (97.94 bu/acre, no-tillage). Fall Armyworm Moth Flight Up-tick…. But why? 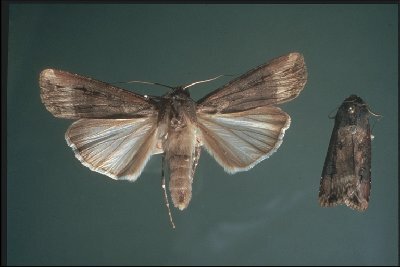 After a drop last week to 487 moths/trap-week from the peak capture of 675 moths/trap-week, capture of fall armyworm (FAW) moths in the UK-IPM pheromone baited trap has increased to 605 moths/trap-week (See Figure 2.). This indicates a continued and elevated risk of infestation by this pest for the next several weeks. This up-tick in moths captured does not indicate another generation. It is more likely that the cool weather in the previous week reduced the number of moths flying and the warm up has done just the opposite. If this is the case, then last week’s moth capture should have been a bit larger and this week’s a bit lower, making the curve appear a bit more normal. Figure 2. 2012 FAW Capture. This spiky appearance to the graph is just due to a small number of data points and a wide span of time (a week) between data points. What is most important is the fact that there are still a great many moths flying and females will still be laying eggs for several more weeks unless there is a drastic change in temperatures. Caterpillars resulting from the egg lay of the current moth flight have already begun to appear. I expect that egg lay resulting from the moths represented by this week’s data point will continue into the first week of October. Caterpillars resulting from the current egg lay could be active through the entire month of October. This is, of course, completely dependent upon temperature. We would normally expect for the threat from FAW to end on or about the first killing frost. Certainly we have eggs and caterpillars, in various stages of growth, currently in the environment that can last past the average first killing frost date. This does not even account for the moths that are currently flying, mating and laying eggs. Thus, small grass crops will remain at risk to infestation by FAW until the weather changes enough to stop the cycle. This usually occurs with a “killing” frost. Looking at Mr. Tom Priddy’s short-term forecast, this should be about the normal Oct. 22 date. FAW is a tropical insect and cold weather will solve the problem. Nevertheless, experience has shown me that light frost will not do the trick, even with air temps near or at freezing. It’s because at the soil / air level, especially in no-till fields, temperatures may remain above freezing. This is certainly true for clear sunny days, when the soil litter can obtain heat from sunlight. Our current change in weather to rainy cool temperatures will slow this insect down. In addition these conditions will select in favor of the cool season grass that have recently been planted. You will need to continue scouting of these new stands, but weather is looking more favorable. At risk crops remain the same, with the possible exception of soybeans. Most of these should be beyond the stage that leaf damage will be important. Sowing or renovating pastures, waterways, and cover crops with any small grass needs to be scouted for FAW. Sowing wheat earlier than the Hessian Fly free date will increase the risk of FAW problems. Even sowing on or after the Hessian Fly free day may not provide control if the normal killing frost is late. Having talked to many producers, consultants, and farm service personnel, it is apparent that the problem remains in detecting the infestation. Control, once the infestation has been spotted, does not seem to be a problem. Q. If I spray for the FAW now, will that prevent a future infestation? A. No. You will probably get some residual activity from your insecticide, but if the weather stays warm, the insect’s life cycle will outlast the residual. As the weather grows cold, the application will be unneeded. Q. If I treat my wheat seed with an insecticide, will that control FAW? A. No, the rates we use on wheat in KY are meant to control very small sucking insects like aphids and Hessian flies. Think how much more massive a FAW caterpillar is than an aphid. This is a rate problem, not whether or not the insecticide would kill FAW. Q. My pasture is mowed off. Has FAW killed my pasture? A. No, it is very unlikely that FAW will kill an established stand. You will lose your yield, e.g., hay, stockpile grazing, etc. There is little difference in FAW and cattle feeding; FAW just have smaller feet! Q. FAW has eaten up my newly sown pasture / waterway / wheat; has it killed my seedlings? A. This is impossible to answer without waiting & watching for re-growth. FAW does not usually kill established grasses. However, if the root system is not well established, some seedlings may die. My experience with wheat tells me you should be careful about reseeding. I have seen FAW graze off a field, making it look dead, then the producer reseeding as soon as possible and ending up with a “double seeding”. This results in many problems in the spring.